I’ve been in Sierra Leone four days now. I left the states five days ago. It’s been both a busy first week and a lot of quiet time in my hotel. This is what has taken up my first days. I flew Delta from Dallas/Fort Worth to Salt Lake City (3 hours), Salt Lake City to Paris (10 hours), Paris to Freetown (6 hours). With layovers it was 22 hours total. At the airport I went through customs, picked up my bags in the next room over, went through immigration in the next room (which consisted of one person glancing at my bags and asking verbally if I had anything to declare. “No”, I said. And then he waved me on. No papers, no fuss. Awesome). Outside I was met by Solomon, a lay leader (maybe the Conference Lay Leader?) who works at the airport. He led me to the buses that would take us to the ferry I’d be riding over to Freetown proper (about a 25 minute ferry). This is where I experienced what I knew was coming: just waiting around. The airport receives sometimes 4, at the most 7 flights per day. Ours was the last flight. No telling how much time there had been between us and the closest flight before us. But I’m sure it was dead quiet at the airport before we got there. The ferry, then, would run as soon as everybody from the flight got on the bus to go. So we waited…for people to get their bags and deal with immigration (although I’m not sure what they would have been dealing with)…for people to navigate the crowd of people circling them to sell sim cards and minutes for their cell phone. It was a full hour and a half between landing and getting on that ferry. On land, I was met by the Assistant to the Bishop, Rev. Rogers, and the Conference Director of Connectional Ministries, Rev. Ashcroft. Then we made it to the hotel, near the beach. There was some fuss about getting my sim card to work. It never did. They said we’d work on it tomorrow. And then I crashed, thankful that the marathon travel day was over. I was told my first priority was finding a place to live. And so Friday Rev. Rogers picked me up and we went on the hunt. The first two didn’t have keys or anybody to meet us. “A waste of time”, said Rev. Rogers. Finally we got into a brand new apartment that I knew immediately was too nice (read: expensive). It was BEAUTIFUL. It even had a gas stove. We saw one of the furnished three bedrooms in that complex too. I told them it would have been the nicest place I’d ever lived in. They seemed very pleased with that. I guess I wasn’t clear enough that that wasn’t really a good thing for me, a missionary. We saw another place that was also too big and too nice. And the third place needed some work. So…we keep looking. On Saturday, Rev. Rogers and my friend Martha (the Bishop’s secretary who’s children are delightful) saw two more. One of them may just work. Fully furnished, security, generator for electricity when the grid goes down, internet, air conditioning in *some* of the rooms. I go today to see if it works. If not…the hunt continues. The United Methodist Church has founded hundreds of schools across the country. (I’ll give you the exact figures in another post.) One thing about being heirs of John Wesley is that education and medical care are very important to us. We are known worldwide for both and Sierra Leone even more so. Almost every time I tell someone I'm a United Methodist Missionary, they tell me they went to a UM school or have been to the big hospital in town. The Sierra Leone Annual Conference has just founded a university, which is a longtime vision coming to reality. The first school to be opened is the School of Theology. On the way to find apartments, we stopped to see it. Up on a hill, it gets a really nice breeze and gives a beautiful view of Freetown. I was introduced to the dean, several professors, the chancellor, and two classes that were going on while we were there. The welcome I received, especially from the students, was really joyful. I still don’t know what I will teach, but I will be teaching something in theology and practical ministry there. The School of Theology deserves it’s own post…coming soon. I. am. so. excited! I was picked up for church at 9:30 am by Olivia. Olivia will be my guide and cultural navigator for the coming weeks and months. She works for the Conference Office specializing in children’s ministries. We went to Charles Davies Memorial UMC, out near Lumley beach. The service started at 10 am (with very few people in attendance). By 11:30 I looked back and the church was full. I was introduced and asked to say a few words about myself. But for the most part, I was there to worship. And it was amazing worship. Our worship leaders were the young adults (18 to mid-20’s I would say). They were so awesome and very talented. There were traditional hymns and a time of “singspiration”. The young adults led probably something like 6 or 7 or 8 special songs. They also had an election for the “Young Adult of the Year” where three nominees sat in chairs holding baskets. Two men and one woman. Row by row we were all invited to walk to the front and put Leones (SL dollars) into the basket of the person we wanted to vote for. I put money into each basket but gave extra to the young woman because I was impressed with her leadership. After the voting, each candidate chose a person to count the money. It was an honor to be chosen. The young woman chose the pastor’s wife, who was sitting next to me. At the end of the service they announced the winner as one of the young men. There was a big celebration among some of the young adults and he stood up and started dancing. So fun! But it was clear there was something wrong. The pastor’s wife and others started protesting. Apparently the wrong candidate was announced the winner. So the pastor stepped in and checked the numbers. Then he named the real winner. The young woman is young adult of the year. All the young adult women stood up and cheered. And then she started dancing. And they danced around her. Then she made a speech in Krio. It was awesome. By this time it was 1:30 pm and the service was closed with blessing. Olivia rushed me out because she had to get me to my hotel and make it back for a 2 pm funeral that she was in charge of. That funeral lasted as long as the morning service, she told me this morning. This is Sierra Leone…church all day. I was sorry to not go the funeral. But I’m also grateful I got to take time to rest. I’m not sure I would have made it. I’ll have to work on my endurance skills. Home for the next week or so. I'm very safe and comfortable here. Notice the rice. I've not had a lunch/dinner meal yet without rice. Up on the left is the pulpit. The preacher is was a professor who has the same height challenges that I do. :-) There were many steps up to get there! Four big buckets for separate offerings...general fund, envelopes (I still don't understand the difference), building fund, and university fund. The buckets are so big because $100 is 760,000 leones that come in denominations of 5000 and 10000. That's a lot of bills! 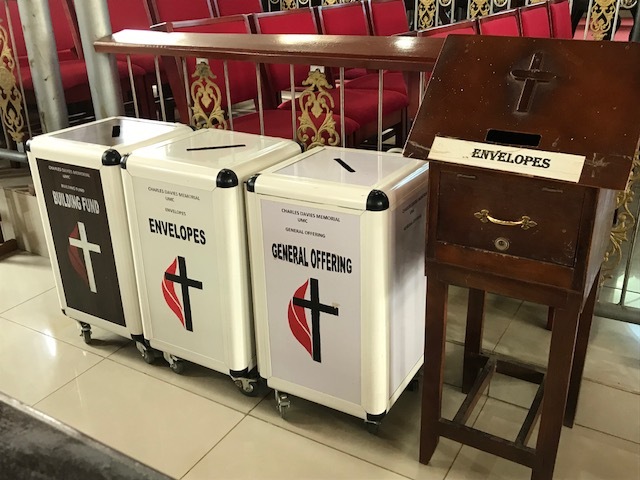 Every person was invited forward for the offering by row (like we do communion in the states) by the stewardship representatives who are in uniform. They are serious about accountable giving! Scripture reading. The woman on the left is a stewardship representative (I've forgotten their official title). On the right is one of the young adults.